iTunes is the Apple’s official PC software that allows you to connect iPhone/iPad/iWatch/iPod, mainly all iOS powered devices, with PC to make changes on Apple devices. Here you can see how to download and install free iTunes skins on Windows & Mac PC/laptop. iTunes skins are extremely popular among PC users, they allow you to changes the look of the Apple iTunes software interface according to your preferences. There are many free iTunes skins for Windows 10/8/8.1/7/Vista/XP (32bit/64bit) and iTunes Themes for Mac desktops/laptops that you can download, install and change on your PC. 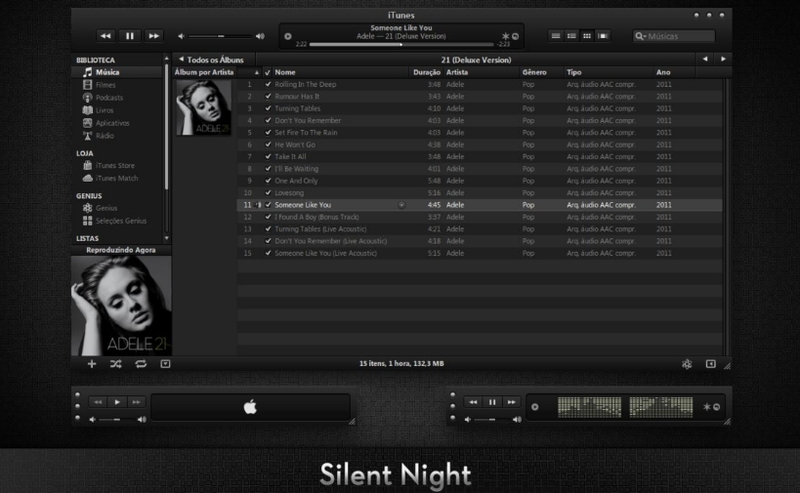 Here you can also download latest version of the most famous of all iTunes skins the Silent Night iTunes Skin. Click on the links below to download best iTunes themes for Windows & Mac. If you think some skins are missing here then see links given in this post to search more skins for iTunes for PC. iTunes skins below are designed and updated by legendary DeviantART contributor Davi Andrade (1davi). Click on links to download skins directly on PC. First iTunes skin in the list of links, Silent Night iTunes Skin for PC, is a must have and perhaps the most popular of all iTunes skins, ever. Due to design and coding changes with iTunes 11, you would only be able to download Silent Night Skin and other smash hit skins for up to iTunes 10.7 versions. Some of the above iTunes Themes for Windows also have Mac version, click on Mac links on the main Windows Skin pages in the links shown above. Click on links below to download Mac version of best iTunes skins that are compatible with with iTunes 10.7 or previous versions. iTunes themes for Mac below are designed, updated and uploaded by Aaron Olive who is regular contributor on Deviant ART website. Note: Due to interface design changes, skins in links below won’t work with iTunes 11 or latest versions. 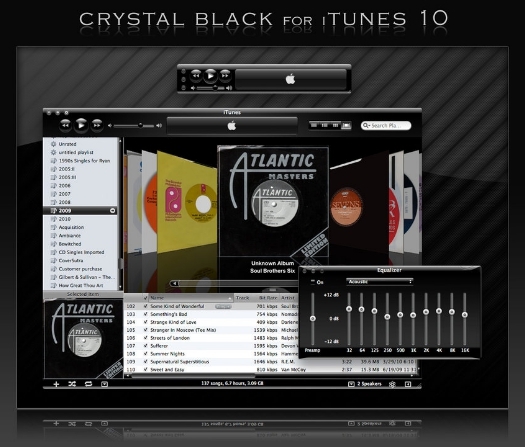 Download Crystal Black iTunes Theme for iTunes 10.1 to 10.6 versions or click direct download link to download this skin for free. If you want to download more iTunes skins then DeviantART is the place for all PC iTunes users to see the work of great designers. Go to DeviantART for more free iTunes skins. Now that you have downloaded best iTunes themes for Windows and Mac, it’s time to install them on PC. 1 – Go to the PC location where you saved downloaded skin installer file and double-click to run and install .exe (Windows) or .DMG (Mac) iTunes skin. 2 – Some iTunes skins require replacement of the original iTunes.rsrc with the newly downloaded version. But always backup original .rsrc file before replacing it with the new one. 3 – Default iTunes.rsrc path on PC is /Applications/iTunes.app/Contents/Resources/iTunes.rsrc. You can reinstall original iTunes.rsrc before updating iTunes app on computer. Note: Copy Rights of iTunes skins and themes belong to their creators. Install them at your own risk. Now let’s see how you can change iTunes skins. If you got bored with one skin and want to freshen up things a bit then see instructions below to changes iTunes skins on PC. I really despise default iTunes look. It has no colors, style, life to it. Here we can see how to modify iTunes skins on PC Windows & Mac to your favorite one. But keep one thing in mind that frequent changing of iTunes skins could cause some stability issues. Those who are still using iTunes 7, doubt there would be many of them, you must be familiar with Multi-plugin that is used to easily switch iTunes themes. But the development team behind Multi-Plugin has stopped releasing updates to the plugin for latest iTunes versions. However, latest iTunes skins come in EXE format, which makes it easy to install and change them on PC. Just click on the exe file using the method described above and it will change the existing iTunes skin. But since EXE files are Windows specific, Mac users may have a harder time to changes skins compared to their Windows counterparts.